Front entrance of the Cigar Factory, photograph by Jeff Holt, Charleston, South Carolina, 2015, courtesy of the Cigar Factory. 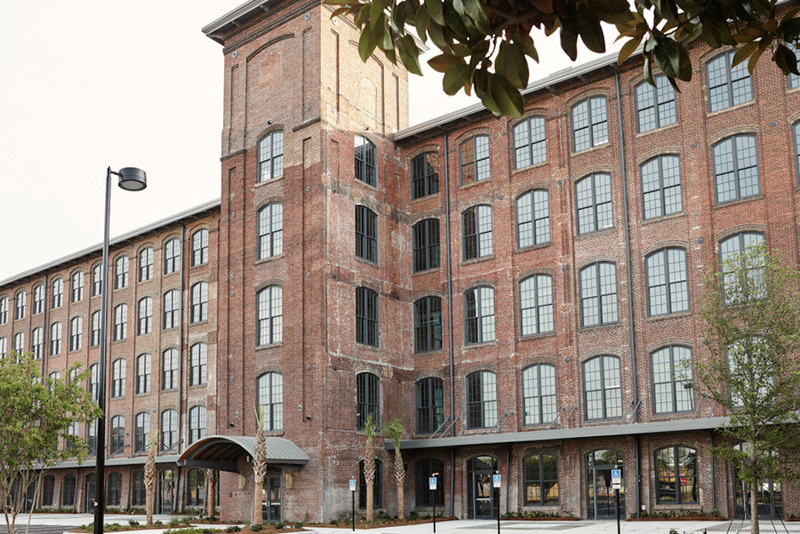 Originally constructed in 1882, this mill building first operated in Charleston as a cotton factory. After various struggles with labor and finances, the city's cotton mill closed in 1900. From 1902 to 1973, the building housed a cigar factory operated by several companies. Starting in 1980, Johnson and Wales University offered culinary arts classes at this site, before relocating to Charlotte, North Carolina in 2006. In 2013, the Preservation Society of Charleston placed a marker to commemorate the Cigar Factory Strike that took place from 1945-1946. After significant renovations, the mill building reopened in 2014 as a space for retail shops, restaurants, events, and offices. The owners continue to call this site the "Cigar Factory." “Many years ago a cotton factory was built in Charleston,” noted Francis Warrington Dawson in an editorial for Charleston’s News and Courier on January 3, 1881. “Owing to a lack of the proper kind of labor, or to bad management, or to general indifference, the factory languished and died, and it has become a ghastly standing joke that the only cotton mill ever started in Charleston was speedily converted into an almshouse, which it is to this day.” The News and Courier published this epitaph just as the city was about to build a new cotton factory across the street from the old one. The article was not meant to be prophetic, but it was. No one believed that a new cotton factory would fail, not in the post-Civil-War world of rapid industrial expansion. Instead, investors expected the enterprise to revolutionize the city’s faltering economy. 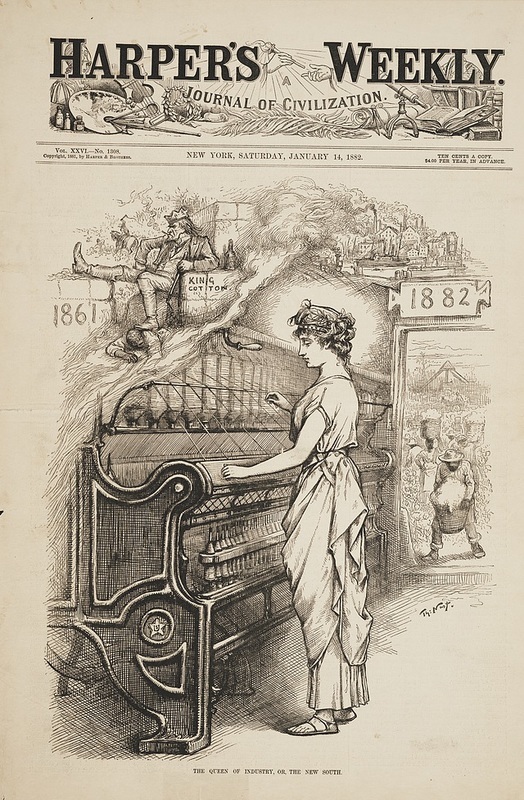 “Bring the mills to the cotton!” was the watchword of this “New South.” “There is really no possibility of failure in cotton manufacturing in the South, as long as the management is skillful and economical,” wrote Dawson in a second editorial one month later. And yet there stood the old mill turned almshouse, right across the street, a specter that should have reminded all concerned that factories—and people—could fail. "The Queen of Industry, or The New South," ca. 1882, courtesy of the Library of Congress, Prints and Photograph Division. In the decades following the end of the American Civil War and the abolition of slavery, southern entrepreneurs looked to rejuvenate the region's economy through developing industry as well as agriculture in the "New South." Dawson had foreshadowed the fate of the new cotton factory with eerie accuracy. Over the next twenty years, it would go bankrupt four times because of poor management, labor struggles, and changes in the world market. Charleston’s cotton factory would also become one of the only textile mills in the nation to hire a black workforce, an “experiment” that would put it on the front pages of newspapers across the country. For years to come, what the media later described as the “ignominious failure” of the cotton factory would frighten Charleston investors away from projects that promised civic improvement and quick profits. The two decades of the cotton factory’s existence ultimately witnessed rapid shifts in public attitudes toward African Americans as whites chipped away at—and then dismembered—the civil rights legislation passed during Reconstruction. Hiring practices at Charleston’s cotton factory detonated a national quarrel over whether black people should be allowed to work in textile factories. Business leaders and those who invested in the new enterprise wanted, of course, to make money. The costs for bricks, cotton, and machinery were fixed—management could not control those factors. But executives could exert some mastery over the cost of labor. White women and children could be paid less than white men, and at first they made up most of the labor force for the Charleston factory, just as they did in countless other textile plants all over the country. In 1882, when the Charleston Manufacturing Company opened its doors, factory jobs were generally understood to be reserved for white men and women—ostensibly because blacks were not capable of doing them, but really because whites wanted to reserve this relatively well-paid work for themselves. Charleston’s new cotton factory would eventually become one of the first large enterprises to challenge that idea, not because its investors and managers believed in racial equality—though they did go against white supremacist orthodoxy by insisting that black workers could be trained as easily as white workers—but because black laborers could be hired for far less money than white ones. And if white women could be paid lower wages than white men, black women could be paid even less. That factor alone was enough to tempt management to hire an all-black workforce in the late 1890s. The magnificent building that resulted from Charleston’s second quest for a textile mill would, over the course of the next century, house a succession of industrial and entrepreneurial enterprises, including the cigar factory that made it famous and that now lends its name to a pricey retail and office development. But long before Charleston’s famous Cigar Factory Strike in 1945-46, the city’s cotton factory workers—black and white, male and female—struggled for better working conditions in the contentious political, social, and economic contexts of the late nineteenth century. 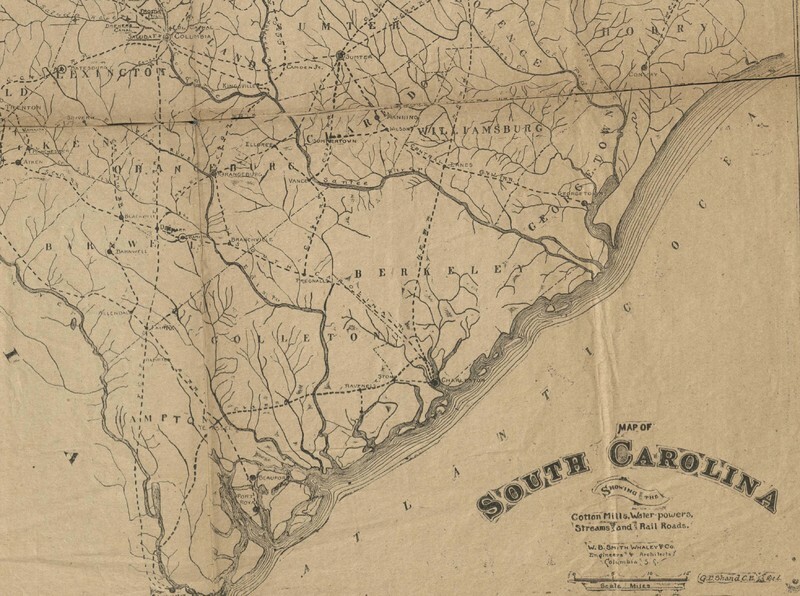 Detail of the Lowcountry in a "Map of South Carolina showing Cotton Mills, Water Powers, Streams, and Railroads," 1895, courtesy of the South Carolina Historical Society. In the 1880s and 90s, the number of cotton mills in South Carolina grew exponentially. Most factories were located in the Upstate, but investors in Charleston's cotton factory, which opened in 1882, believed that its close proximity to the port of Charleston would cut shipping costs.